VANKLEEK HILL, ON – Halcyon Barrel House – an off-shoot of Beau’s All Natural Brewing dedicated to mixed fermentation and barrel aged beers – has announced the release of its latest limited edition beer. Curse of Knowledge is a barrel-fermented, barrel-aged blended farmhouse saison with brett. Spice and more delicate herbal, fruity and floral elements are rounded by its relationship with wine. 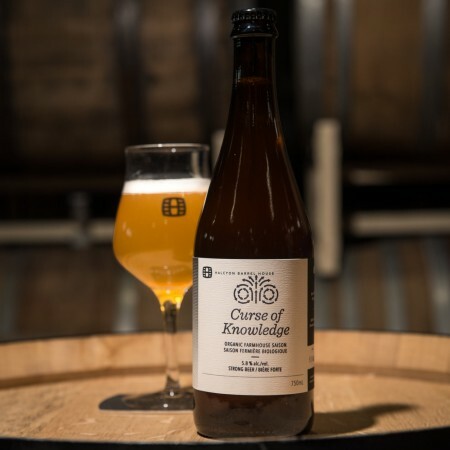 Inspired by the farmhouse saisons of old, Curse of Knowledge is brewed with a house blend of several saison yeast and brett strains, and aged in red wine barrels for six months before blending. it is dry hopped with two french hop varieties, strisselspalt and mistral. Effortlessly drinkable, assumingly complex. Curse of Knowledge is available at the Beau’s retail store & taproom and BYBO delivery service while supplies last.